Acrison - Jim Robbins & Associates, Inc.
Acrison’s longstanding commitment has been maximum performance, minimal maintenance, long lifespan. We carry Acrison equipment not just because of this reputation, but because of the level of innovation the company brings to dry solids handling. Let us know what process needs you’re dealing with and our team will help you find a solution. Gravimetric feeders or weight-loss feeders base feed rate on just one factor: the loss in weight of the product in the feeder over time. This results in an incredibly precise, even flow rate. Acrison gravimetric feeders use a precise, highly durable weighing and control system, and are intended for 24/7 use over long periods of time. 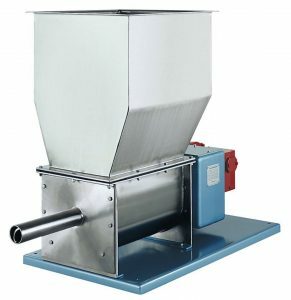 Volumetric feeders discharge a consistent volume of product, typically using a rotating auger to feed the product out. These are very versatile, rugged feeders that require little maintenance. One of the advantages Acrison offers is a wide variety of auger types to suit different dry solids. This allows you to keep a uniform, reliable feed even with sensitive, adhesive or clumping product. Acrison offers a number of batching systems. Your operation can centrally control dozens of feeders batch-feeding into a single batch dump/weigh hopper, with weighing control across the entire batch. Create and save unlimited batching sequences and supervise everything from one central control system. Acrison’s blenders include options for mixing dry solids with other dry solids, or dry solids with liquids. Their flagship offerings include a classic single auger blender as well as their unique dissimilar speed, double concentric auger mechanism which can smoothly blend even the most difficult products. Choose from classic flat bottom bin dischargers and vibrating bin dischargers, or Acrison’s high-performance multiple auger/multiple agitator system, which promotes flow of the widest variety of dry materials. We are consistently impressed with Acrison’s high-performance approach to waste and wastewater treatment. Double Concentric Auger/Dissimilar Speed feeders and triple auger feeders are designed to handle all the chemicals and additives common to wastewater treatment. Safe chemical unloading technology, dust collectors, dissolving tanks and wetting cones are all built to perform with minimal maintenance. Acrison even offers a cyclone wetting chamber to make dilute solutions from dry polymer. At Jim Robbins & Associates, we believe in providing equipment that suits your exact needs—and solves problems for your operation. Want to see if our Acrison lineup can help you? Come on in and test out our demo equipment. Have an application? Complete our Feeder Application Proposal Request for a complimentary proposal!